Massy The Creator (aka Michael DaCosta) represents a new wave of reggae & dancehall vocalists emerging out of the Caribbean. Growing up in Kingston as a youth he listened to soundsystems such as Bass Odyssey, Stone Love and Metromedia, while also paying close attention to the evolution of hip-hop music in the US and beyond. Like fellow Jamaican artists Kabaka Pyramid and Protoje, Massy boasts a lyrical style and flow that takes the best of these influences and creates something entirely fresh and original – fast flows, deep lyrics and the ability to both deejay and sing in a distinctly new Jamaican style. Massy’s name was given to him by the artist Serani, who was impressed by his ability to ‘lyrically massacre’ any instrumental thrown his way. More than just a singer/performer however, Massy is also skilled as a producer, songwriter, videographer & graphic artist, and has produced songs for some of the biggest names in reggae including Chronixx, Elephant Man, Kabaka Pyramid & TOK. 2014 has seen Massy touring Europe extensively alongside Naaman (French Reggae Artist Of The Year 2013), coinciding with the release of their hit single “Chill Out”. Massy is currently putting the finishing touches to his debut album Future Roots, which aims to present roots reggae in its “evolved state”. 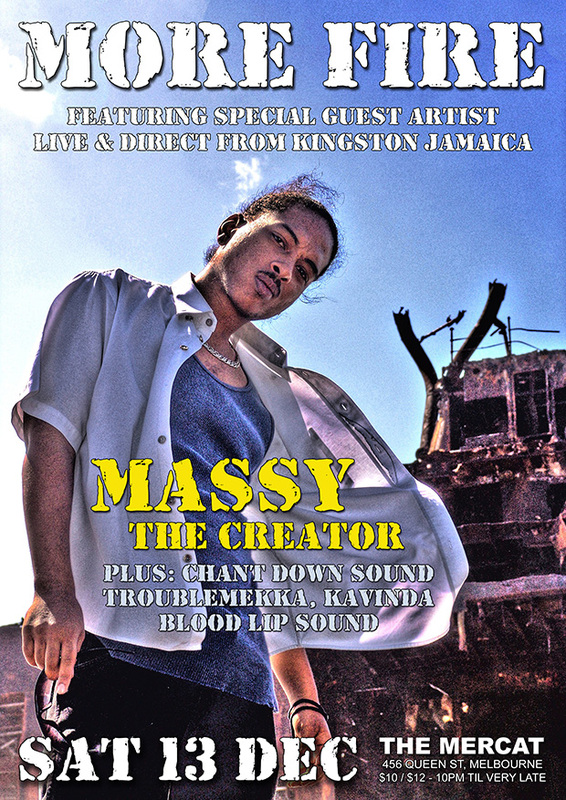 Massy The Creator will be performing live at More Fire alongside Chant Down residents Jesse I and Ras Crucial, with support from Troublemekka, Blood Lip Sound, and Kavinda. More Fire # 166 takes place on Saturday 13th December at Deep 11 (Mercat Cross Hotel basement, 456 Queen St, Melbourne). Doors open at 10pm, with a cover of $12 or $10 for concession holders and PBS FM members.